Historically, the Royal Military Police and its predecessor, the Corps of Military Police has been one of the Army's smaller units. During the two world wars however, the Military Police was expanded greatly in order to be able to cope with the increased requirements of discipline, crime investigation and traffic control demanded by the increase in size of the Army. After WW II it was felt that the many men and women who had served in the Corps should have the opportunity to maintain their links with the Corps and former colleagues. 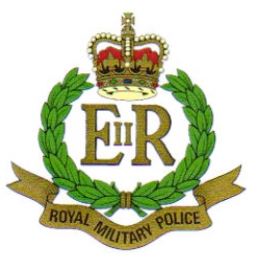 As a result, the Royal Military Police Association was formed from former Old Comrades Associations. Between 1945 and 1959 the ranks of the RMPA were swelled by the numerous former National Servicemen who served in the RMP during that period, and who saw action in the many 'Emergencies' and 'Police Actions' such as Korea, Malaya, Cyprus and Suez. Originally, many of the larger towns and cities of the old West Riding of Yorkshire, including Leeds, Sheffield and Bradford had individual Branches of the Association, providing social gatherings, comradeship and welfare facilities to serving and former Military Policemen and women. However, due to the gradual ageing of the members leading to declining membership, the former Bradford and Leeds Branches amalgamated in the late 1970's to form the West Yorkshire Branch. Our members range from W.W.II veterans to those who served with the Corps in more recent times in Germany, the Middle East, Cyprus, the Far East, and Northern Ireland. RMP Website The website of the Royal Military Police.